Family Playlists are a groundbreaking innovation that enables families and teachers to partner more effectively to support student learning. See how Family Playlists completely transformed a district public school located in New York City. Research shows that family engagement is critical to supporting student success in school, and the type of family engagement that matters most is what families do at home to support their children’s learning. Click below to download our Case Study on Family Playlists and learn how Family Playlists completely transformed family engagement at South Bronx Preparatory. This Case Study covers the first year of implementing Family Playlists™ with the sixth grade at South Bronx Preparatory. This district public school, which is located in a high-poverty neighborhood in New York City, has historically struggled to engage parents in its educational efforts, and welcomed Family Playlists as a potentially effective tool to do so. We developed Family Playlists to strengthen the triangle of learning relationships between students, teachers, and families to improve student mastery and social emotional learning (SEL) skills. When students work on a Family Playlist, they first complete a few activities on their own; then they teach what they learned to a “Family Partner;” and then the Family Partner provides feedback to the teacher on whether their child seemed to understand the material so the teacher can better meet the needs of his or her students. The results of the Family Playlist roll-out were unprecedented: 91% of families participated in Family Playlists and a surprising 84% of participating families chose to submit personal feedback to their child’s teacher that was filled with pride and emotion (e.g., “I enjoyed working with my son on this assignment; I am very proud of my son’s accomplishment”). The intervention also demonstrated a significant improvement in the learning relationships between students, teachers, and families, with 100% of participating families agreeing that the program helped them understand what their child was learning in school. Teachers were able to communicate with families more frequently, and they developed stronger relationships with each other. Students were not only teaching academic concepts to their families, they were also teaching socio-emotional learning competencies like persisting when struggling and keeping a growth mindset about learning. 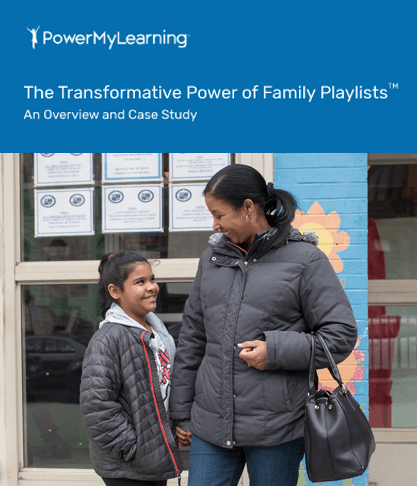 The success and innovation of Family Playlists in New York City has sparked its expansion to schools in other PowerMyLearning regions and to schools outside our regions. Family Playlists are exclusively available on PowerMyLearning Connect: School Edition, our subscription-based platform for schools and districts. Want to get your school or district involved? Check out our affordable pricing model and fill out this brief form to get in touch today! PowerMyLearning also offers coaching and professional development services. For immediate support, please contact Bill Rappel at brappel@PowerMyLearning.org. EdSurge, Want Students to Remember What They Learn? Have Them Teach It. Click below to download your free copy of our Case Study on Family Playlists. It was nice to work with my daughter on her homework so I could fully understand what she is doing in class. I have learned some things from her while she was teaching me about coordinate planes. It was good to get a good knowledge back from such a long time ago from my great big girl.